Suraj is using Smore newsletters to spread the word online. Parabola are everywhere! 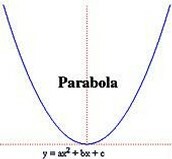 Everyone sees many parabola on a daily basis. Oxford's Dictionary states that a parabola is "a symmetrical open plane curve formed by the intersection of a cone with a plane parallel to its side. The path of a projectile under the influence of gravity follows a curve of this shape" (Oxford). Vertex - The minimum or maximum point in the parabola. Optimal Point (Minimum or Maximum Point) - The highest or lowest Y value in the parabola; The Y value of the vertex. Y-Intercept - Where the parabola passes through the Y axis. X-Intercept (Zeros/Roots) - Where the parabola passes through the X axis. Axis of Symmetry - The middle point of the parabola; The X value of the vertex. Vertical Stretch - When the A value exceeds 1, or is below -1, the parabola is stretched along the X axis. Vertical Compression - When the value of A is between 1 and -1, the parabola is squished closer together along the X axis. 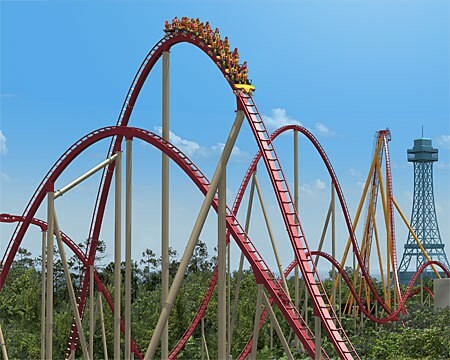 Everyone has either been on, or seen a roller coaster within their lifetime, but not everyone knows that roller coasters are also parabola. 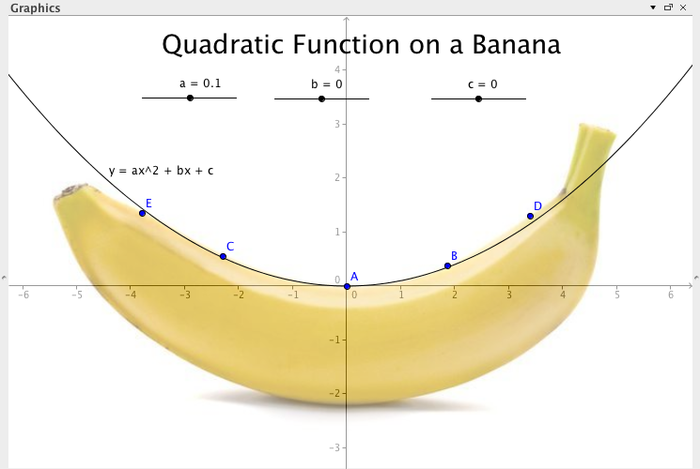 Many people, and even some animals, eat bananas; but not all of them know that bananas are also parabola. 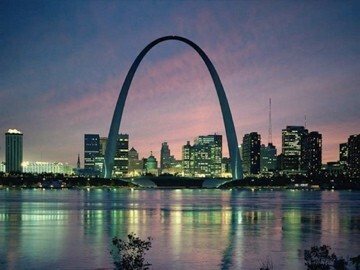 Many people awe at the site of wondrous landmarks and structures, but not all of them know that they are in awe at a parabola. In order to find out whether data forms a linear, or quadratic relation, a data chart must be used. If the differences in the first bunch are the same, or follow a certain pattern, the data forms a linear relation. If the differences are the same, or follow a pattern in the second bunch, then the data forms a quadratic relation. If the data is not the same, or it doesn't follow a pattern in the first or second bunch, then the data has no relation. 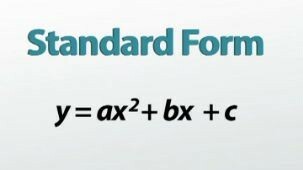 Standard form equations are the easiest to graph, and they are also the easiest to change into either factored, or vertex forms of equations. In order for a standard form equations to turn into a vertex form equation, one must factor using the technique of completing the square. As one follows this formula, they will get to the step of square rooting a number that is inside of the square root, that number is called the discriminant. 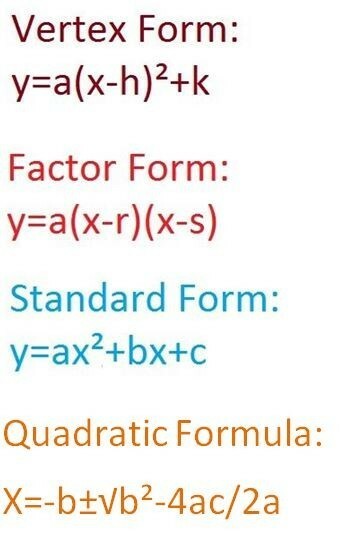 One is able to find how many results will come up at the end of the quadratic formula by looking at the discriminant. If the discriminant is a positive number, then there will be 2 results. If the discriminant is 0, then there will be only 1 result. If the discriminant is a negative number, then there will be no results. In order to use common factoring, the greatest common factor (GCF) of the entire equation must be known. The GCF is 3, because each term is dividable by 3. Trinomials contain 3 terms within them; X^2+BX+C. There are no A values in Simple Trinomials, because if there were, they would be considered as Complex Trinomials. 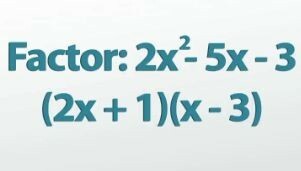 In order to solve a Simple Trinomial equation, one must find 2 numbers that, once multiplied, equal up to the C value, and once added, equal up to the B value. could multiply by each other to give the C value. Complex Trinomial equations are essentially Simple Trinomial equations, but with an A value, so they can not be factored the same way. Vertex form equations are a type of quadratic equation that include the X and Y values of the vertex within them. Vertex form equations are mostly used to find certain point within the parabola to better ensure the parabola is made correctly. The A value before the brackets in vertex form equations decide a multiple number of various things. If the A value is positive or neutral, the parabola opens upwards, and if the A value is negative, then the parabola opens downwards. Whether the A value is greater than 1, or smaller than -1, also affects the parabola. If the value of A is greater than 1 or less than -1, then the parabola is stretched along the X axis (horizontally). If the A value is between 1 and -1, then the parabola is compressed along the X axis. 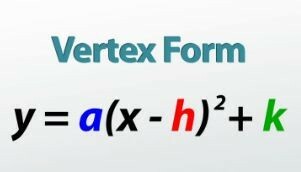 In order to change a vertex form equation into a standard form equation, one must expand and simplify. In order to change a vertex form equation into a factored form equation, one must set Y=0, and then proceed to find the zeros. allows for the axis of symmetry to be found. Once the axis of symmetry is found, it can be placed in the original equation, substituting X, which would allow the equation to be solved. Once the equation is solved, the number given at the end is going to be the Y value of the vertex, and the axis of symmetry would be the X value of the vertex. In order to change a Factored Form Equation into a Standard Form Equation, one must expand and simplify the equation. In order to change a Factored Form Equation into a Vertex Form Equation, one must find the axis of symmetry, and then plug that into the equation. Once the axis of symmetry is in the equation, one must solve the equation, which will give them the Y value of the vertex. The Y value of the vertex would be the end result of completing the equation, and the X value of the vertex would be the axis of symmetry. P=-60(x-4)^2+120, where X is the price of a bad of popcorn. A) What should the price be to maximize the daily profit? What is the maximum daily profit? This question is indirectly asking for the vertex, which can be determined from the H and K value. Therefore, in order to maximize the daily profit, the price should be 4 dollars. The maximum daily profit is $120. B) Determine the price needed for the vendor to break even. Therefore, the price of the popcorn should be $5.41 or $2.59 in order for the vendor to break even. A flare is released into the air following the path, H=-5(T-6)^2+182, where H is the height in metres, and T is the time in seconds. A) What was the flare's maximum height? In order to find the maximum height, the time should be 0. Therefore, the maximum height that the flare will reach is 2 metres. B) What was the flare's initial height? 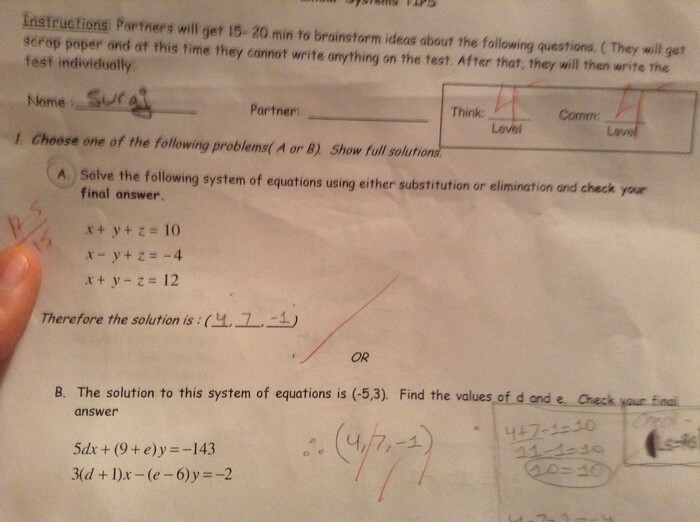 This question is asking about what the K value is in the equation; H=-5(T-6)^2+182. The K value in this equation is 182. This means that the initial height of the flare would be 182 metres. P=-11(T-55)^2+10,571, where T dollars is the cost per ticket. A) What will be the profit if the tickets were free? B) How much should be each ticket cost to break even? Therefore, the tickets should cost either $86 or $24 in order to break even. 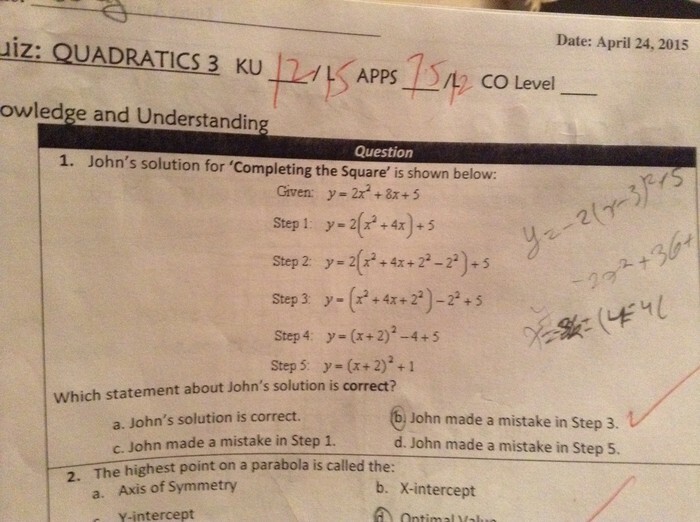 I have learned a great deal of information within quadratics that will be sure to aid me in my future endeavors. The Quadratics unit has taught me that math can be very fun and extremely useful at times, and that I should always see things through, because at first i did not enjoy the quadratics unit, but now, I find it to be one of my favourite units. Quadratics have also taught me that working hard, studying, determination, and perseverance will always pay off in the end. They are always worth it when the end results are good, and high marks.